This image of Mercury’s south polar region from NASA’s Messenger probe shows a map colored on the basis of the percentage of time that a given area is sunlit; areas appearing black in the map are regions of permanent shadow. New evidence from the first probe to orbit Mercury is building support for the idea that the tiny planet may be harboring water ice in some of its most extreme terrain. Certain areas of Mercury's poles were previously found to be bright in radio waves detected by radar measurements from the Arecibo Observatory in Puerto Rico. Now, the Messenger spacecraft has found that those same bright radar spots appear to be in permanent shadow, according to camera views from the probe's Mercury Dual Imaging System (MDIS). "We've never had the imagery available before to see the surface where these radar-bright features are located," Nancy Chabot, an instrument scientist for MDIS at the Johns Hopkins University Applied Physics Laboratory, said in a statement. 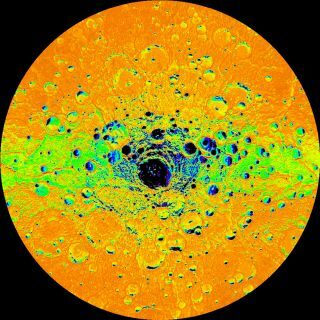 "MDIS images show that all the radar-bright features near Mercury's south pole are located in areas of permanent shadow, and near Mercury's north pole such deposits are also seen only in shadowed regions, results consistent with the water-ice hypothesis." The Messenger probe's Mercury findings are not conclusive, though. Those bright spots could represent some other substance, the researchers said. Plus, some pieces of evidence don't fit together perfectly. For example, some of the craters are thought to have temperatures inhospitable to water ice. Many of the locations would require a thin layer of insulation to keep the ice colder than the surface, which is thought to be slightly too warm, Chabot said. The highest-resolution radar image of Mercury’s south polar region made from the Arecibo Observatory (Harmon et al., Icarus, 211, 37-50, 2011) is shown in white on MESSENGER orbital images colorized by the illumination map. Radar-bright features in the Arecibo image all collocate with areas mapped as in permanent shadow, consistent with the proposal that radar-bright materials contain water ice. Ultimately, the scientists have a better picture of these intriguing areas now than ever before, and they hope to solve the mystery with further study in the future. If there is water ice on Mercury, the planet will not be alone. Earth's moon, which is only slightly smaller than Mercury, also seems to have water ice at its poles. Evidence for frozen water has also been found on Mars and many asteroids in the solar system. Messenger (short for MErcury Surface, Space ENvironment, GEochemistry and Ranging) launched toward Mercury 2004, and arrived in orbit in March 2011.The $446 million probe has completed its initial one-year mission and is on an extended mission at Mercury until March 2013. Chabot presented her latest findings last week at the 43rd Lunar and Planetary Science Conference in The Woodlands, Texas.